Hotel worker attacks Israeli toruist with a chair and a machete in Brazil, nearly cutting his hand off. An Israeli man nearly lost his hand when he was attacked with a machete by a hotel employee in in the city of Morro de São Paulo in Brazil, Yisrael Hayom reported. 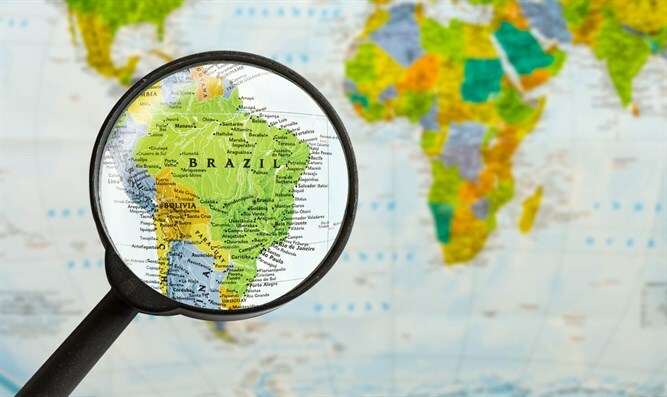 The incident took place last weekend at one of the tourist destinations in Brazil, where many young Israelis arrive during their trip to South America. The victim recounted the harrowing attack to Yisrael Hayom. "I was on the promenade and I bought food. There are no bathrooms nearby, so I found a quiet corner that is not connected to the hotel, just a quiet corner with grass, to do my business. Suddenly, a worker at a nearby hotel ran up to me with a chair, and hit me in the face with the chair and cut open my lip. I did not know what to do, I defended myself. When I managed to neutralize him, I asked him to stop and I asked, 'What's wrong?' He didn't answer, and then two local people came and joined him in beating me. I managed to get away from them and fled to a nearby area where there were Israelis. I called them, and told them that locals beat me. They saw that I was all bloodied and accompanied me back." The Israeli traveler returned to the hotel area accompanied by his friends, but the hotel employee who attacked him was waiting for him there. "I couldn't really see him," he recalled. "I saw similarities, but then I realized it was him. In seconds there was another fight. The Israelis were behind me, and I heard one of them shouting 'be careful! He has a machete!' I didn't have time to react before he swung it. He cut me very badly, tearing all my flesh, and I was soaked with blood." His hand had been cut badly on the palm close to the wrist. Immediately after the incident, the hotel worker realized that he had seriously injured the Israeli and fled the scene: "He understood what he had done and tried to escape, I ran away quickly to get treatment ... I shouted that someone should make me a tourniquet. They tried to make me an improvised tourniquet with all sorts of methods, and I also tried to use a plastic bag, but without success. We got to a local health clinic, but they were unable to take care of me and sent me to the hospital. For many hours I had only amateur bandaging, and it was six hours before I was treated by a hospital. Today, a few days after the incident, I am here in Brazil, resting and feeling a little better. It was a miracle that I did not lose my hand. I should emphasize that there were also locals who helped me get medical treatment." The hotel worker was arrested following the incident. He was released shortly after his arrest.